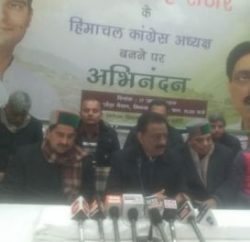 Himachal Pradesh Congress Committee (HPCC) today criticised the move of BJP in which the opposition party has decided to present a charge-sheet against Chief Minister Virbhadra Singh led Congress government on the completion of one year and said that the BJP was trying to mislead public of the state on false allegations. HPCC Spokesperson Naresh Chauhan said that it is routine practice of BJP as they had presented such chargesheet in the past also. 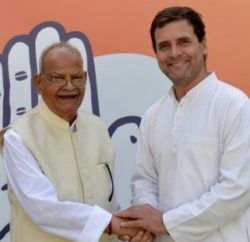 He said that the chargesheet was nothing but mere a publicity stunt and during the tenure of former Prime Minister Atal Bihari Vajpeyee, BJP leaders has presented 25 point chargesheet against the government with CBI. But these were false allegations and all the charges against the then Virbhadra led state government were quashed by investigating agencies. 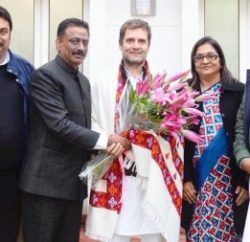 Congress spokesperson said that the former BJP led government was involved in various scams in the state which include HPCA, phone tapping and land grabbing and the state government has already started vigilance inquiry into these cases. Chauhan said that the opposition parties was merely trying to divert the attention of general public from the scams committed during its regime by levelling false allegations on Congress leaders. HPCC Spokesperson said that BJP was playing negative politics in the state and in the recently concluded Assembly Session; the opposition party had disrupted the proceeding in the house on frivolous issues and staged walkouts instead of holding discussions on the issues of public interest. He believed that one year old Congress led state government has taken many decisions in the interest of general public. He claimed that Congress have fulfilled many promises we had made in the election manifesto. He said that our government had started various schemes in the interest of general public as Skill Development Allowance, Rajiv Gandhi Ann Yojna and free travelling facility to government school students. He said that around 17,000 unemployed youth have benefitted from the Skill Development Allowance scheme while around 36 lakh people in the state are getting wheat @ Rs 2, rice @ Rs 3 and pulses, edible oil and other items at subsidised rates. Congress spokesperson stated that if the BJP leaders tried to label false allegations on our leaders, we will file defamation case in the court against those leaders. The state BJP is to submit a charge sheet against the government to the Governor Urmila Singh on 25th December.